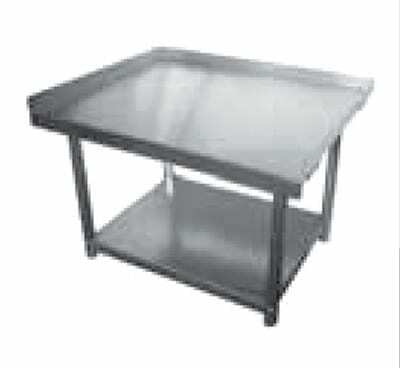 Elkay SES30S36-STSX Equipment Stand w/ Adjustable Stainless Undershelf, 30x36x24"
Equipment Stand w/ Adjustable Stainless Undershelf, 30x36x24"
The Elkay SES30S36-STSX equipment stand is perfect for prepping dishes or using as a table for various equipment. The stainless steel undershelf is adjustable so you can store various types of equipment and products. The 2-inch turn ups on the left, rear, and right of the unit prevent product and juices from rolling off the edge. This table comes with two galvanized hat channels for strength, while the 11⁄2-inch-diameter galvanized tubing with plate gussets on the legs provide stability. The 1-inch feet on the bottom of the legs are adjustable to accommodate uneven flooring. Complete constructed of stainless steel, the Elkay SES30S36-STSX equipment stand is durable and resistant to corrosion.